Kept secret since its discovery in 1974, Kartchner Caverns, 12 miles south of Benson, Arizona, was announced to the world in 1988. Still virtually pristine, this massive limestone cave has 13,000 feet of passages and two rooms as long as football fields. Finally opened as a state park November 12, 1999, this underground wilderness will remain protected while offering visitors a rare tour through multi-colored cave formations. The temperature inside the caverns averages 68°F year round, with the humidity at 99%. See video on the description page. The Discovery Center is fully compliant with ADA guidelines. Ramps are provided with slopes, there is complete access to the auditorium with special seating for wheelchairs, and turn-around restrooms. The phone, drinking fountains, signage, and doors are all designed to be ADA compliant. The Throne, Rotunda and Imaginary rooms tunnels and trail are entirely barrier-free for wheel chairs. The concrete cave trail with hand railings is about is 40" inches wide. The entire length of the tunnel and trails is approximately 1/2 mile. There are only a few areas with slightly steep grades that may require extra help to push someone in a wheelchair. As was mentioned before, guests who are visually impaired are provided the opportunity to touch fiberglass stalagmite reproductions inside the Discovery Center. Big Room Tour: Length: 1/2 mile Time: 1 3/4 hr. The Kartchner Caverns story is one of amazing discoveries...both past and present. Stand where the discoverers first entered the cave. Marvel at the strange and colorful formations. 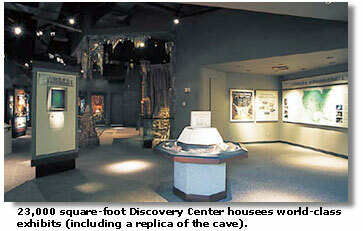 Learn about cave inhabitants, both ancient and living. As scientific studies continue, discoveries are yet to be made. The Big Room tour is a longer and more physically challenging tour. Children age 6 and under are not allowed on the tour. Pictures copyright Arizona State Parks.